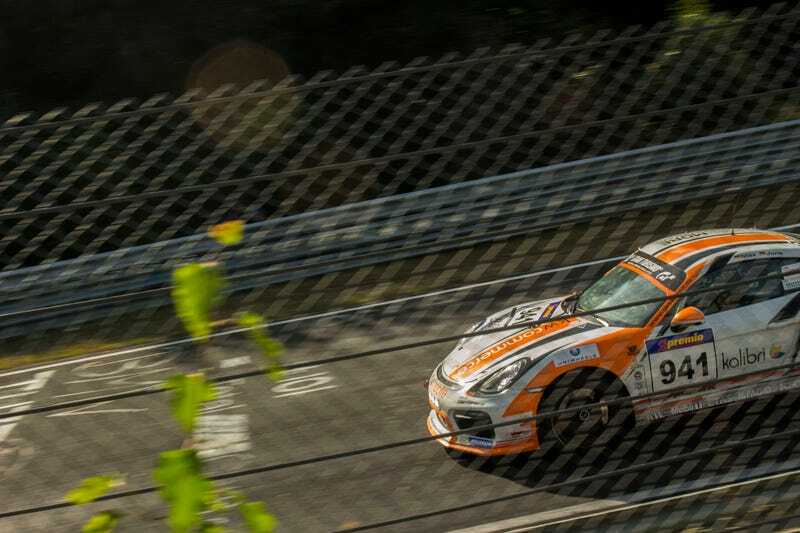 In the first weekend of September, a friend and I decided to make the drive down to the Nürburgring (roughly 250 km), in order to watch the ROWE 6 Stunde ADAC Ruhr-Pokal-Rennen, better known as round 7 of the VLN championship. For those unfamiliar with the VLN championship: The VLN championship is a multi-class racing league for endurance racing running on the full Nürburgring, combining the GP strecke with the Nordschleife. The large entry field (a healthy 113 cars) consists of cars from all over the spectrum, ranging from a simple Peugeot 306 run by a family team, to full on GT3 cars from teams like Black Falcon. In this case, the race lasted 6 hours, which meant each car was ran by multiple drivers, which is not mandatory in the shorter 3 hour races. We arrived just in time, but missed the first pass of the first group of cars through Hocheichen, since finding a parking spot near the track entrance appeared to be hard, which is to expect for an event with free access to the whole Nordschleife, the GP strecke had a €15 entry fee, but we didn’t even have time to go there, since we wanted to explore as much of the Nördschleife as we could. After spending some time in several corners between Hatzebach and Hocheichen, we walked back to the car, in order to drive towards Adenauer Forst. However upon arriving in the parking area, we found out is was full, and since I knew it would still be quite a long up hill walk in the burning sun, we decided to go to Breidscheid instead (my friend is quite the Dutchguy, including the pale skin, so he’d probably have burned his skin even more had we walked the to Adenauer Forst). Having parked at the Aldi, got some fries at an imbiss, and climbed the stairs to the Breidscheid viewing area. Having walked back to the car, we decided to drive to Brünnchen. However, since we ended up parking closer to Pflanzgarten than to Brünnchen, we decided to check out Pflanzgarten first, after which we walked along the track to Brünchen. We ended up in a nice quiet spot hidden in a small forest, where we were able to take some nice photo’s of cars doing high speed passes. Brünnchen ended up being a bit harder, since there we had to shoot through a high fence (we only discovered the photography cut out once the racing had finished...), but it was a nice way to end the day. We had no idea who won though, until we checked it when we were back in the Netherlands and had our 4G coverage back. I don’t know why, but I just love the ROWE M6. (Brünnchen). All in all I really enjoyed the race, and I’m sure I’ll return someday (maybe even for the 24 hour version). The roads around the Nürburgring are also great to drive, though it was quite a challenge for me to keep up with traffic, since on some parts there is no (clear) speedlimit. This meant most people drove around 100 km/h, only slowing down in the corners, but the Twingo misses some torque to be able to keep up. Next to the enjoying the racing, I also think I honed my photography skills quite a bit (it was actually only the second I shot moving vehicles). Of course remarks/comments about the pictures and the way they have been edited are welcome. I hope you enjoyed the read and the pictures, as much as I enjoyed the racing, and taking the pictures!